Y'know those days when you're craving something crunchy yet gooey, cheesy yet healthy, filling yet light? 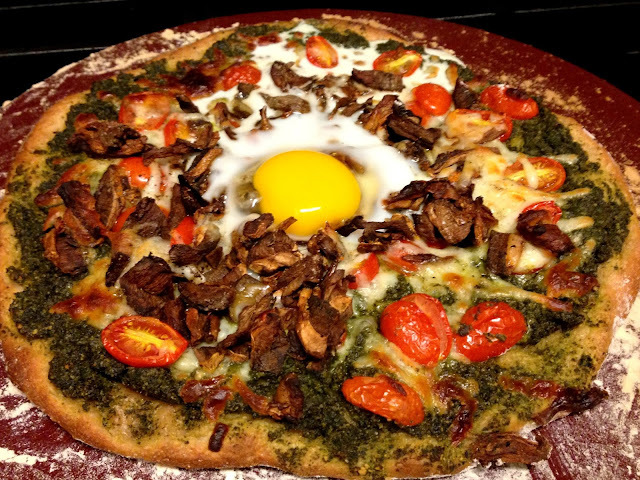 Well, for those contradiction filled evenings, here's a yummy summery pesto pizza for you. I used whole wheat frozen dough here, but as with all thing whole wheat (and whole grain generally), it tastes a little...well...a little too healthy! Just as with a good ol' grilled cheese or even just plain ol' toast with butter and jam (my favorite)! Anyway, where were we? Oh right, pizza. Use regular dough for a more traditional pizza flavor, use whole wheat if you're trying to make this healthier. Place pizza stone in the middle rack of the oven and preheat to 500. You want the pizza stone already nice and hot when you put the dough on there to get a crust with a good bit of crunchiness to it. Bring the dough and pesto to room temperature. Soak the mushrooms in a cup of water to reconstitute them. You can also use a cup of fresh mushrooms, but we just happened to have dried on hand. Once they are plump, drain them (you can reserve the water with its umami mushroomy flavor for a soup or something). Slice the grape tomatoes into halves. These were delicious - from my parents' backyard! Totally organic and talk about knowing where your food comes from! Plus they make this pizza so essentially summery, and they get super sweet and roasty. Sprinkle flour generously on a square of aluminum foil (or a pizza peel if you're getting fancy). Stretch the dough out with your hands and lay it on the aluminum foil. 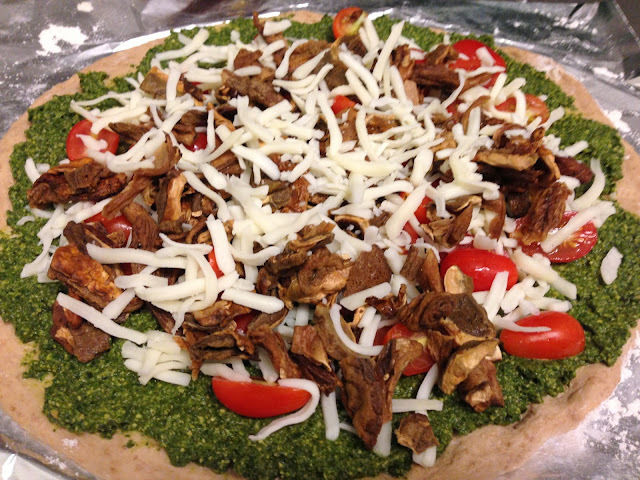 Spread the pesto evenly over the dough, then sprinkle on the grape tomatoes and mushrooms. Sprinkle shredded mozzarella cheese on top. Carefully remove the pizza stone from the oven (it's going to be very hot! 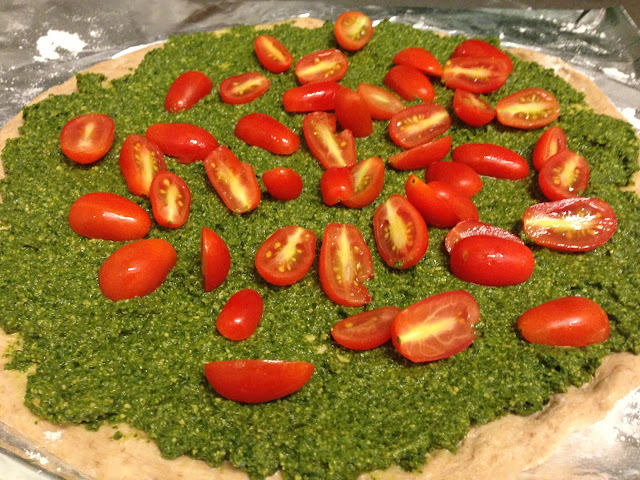 ), then slide the pizza dough from the aluminum foil (or pizza peel) onto the pizza stone. If you're more skilled or if you have a pizza peel with a long handle you can probably do this while the stone is in the oven itself. Pop the pizza into the oven, lower the temp to 450, then let it bake for 15 minutes. Open the oven, pull the rack out a little, and crack an egg in the center of the pizza (I cracked my egg into a little bowl before pouring it onto the pizza, because otherwise you risk getting some shell in there, and you don't want to have to dig around on a hot pizza for a bitty piece of eggshell). Close the oven and let it bake for 3-4 more minutes or until the egg has cooked and set. Remove, add a crack of fresh pepper, slice, and dig in!